Most individuals with ADHD will tell you that they are organizationally challenged, have difficulty completing tasks, and struggle with time management. 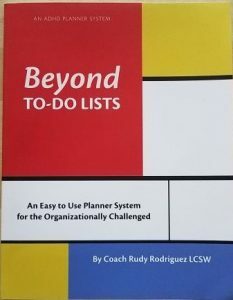 Beyond To-Do Lists introduces a systematic approach to organizing your time that will result in less stress better results and greater productivity. The system is comprised of a series of unique tools and planning forms, allowing you to achieve the results you desire. Give the gift of organization!! Place an order below for yourself or a loved one in need of some help in planning. CoachRudy is the founder of the ADHD Center for Success and specializes in ADHD and Executive Function Coaching. He has worked with ADHD clients since 1981 and was personally diagnosed with ADHD in 1993.